Auction ends: June 26, 2016, 8:30 AM PDT. 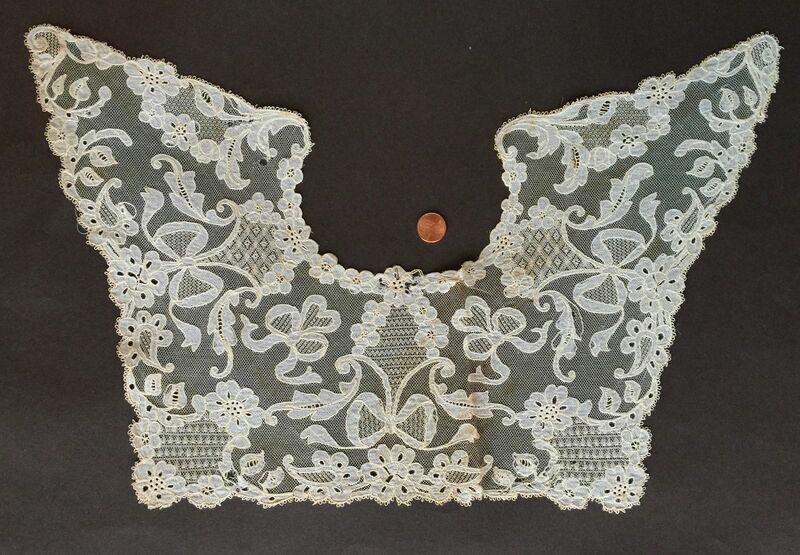 Comments: A flounce of Brussels bobbinlace applique on machine net. 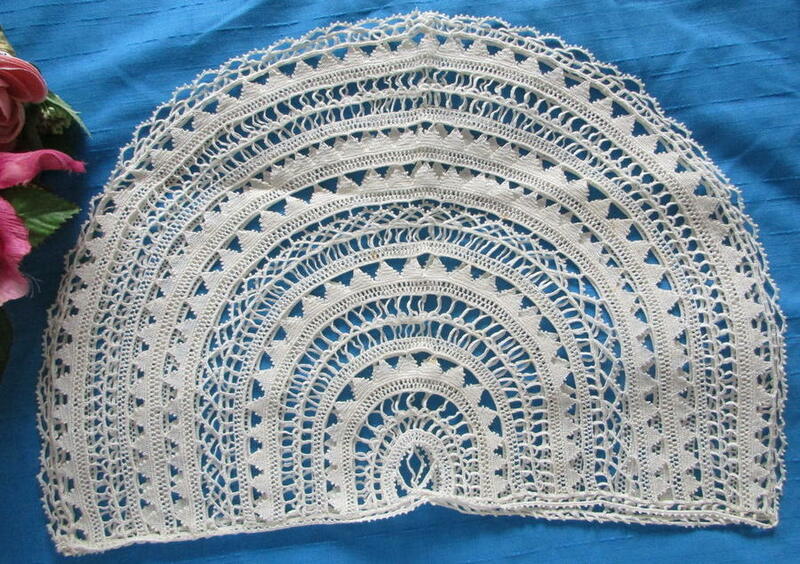 n Fairly simple design with a short repeat of a denser lower border, circular esprits and buds n the upper ground. A more middle-market piece. Modifications: One join. Cut both ends. Damage: Localized small holes and pinholes in the mesh. Finish: A little creased in places along the top edge. Sold for £142.00, 7 bidders. Auction ends: June 26, 2016, 8:50 AM PDT. Comments: A Brussels Duchesse fan with original box. Mother of Pearl sticks. No raised work in the central Point de Gaze insert, and decorative ‘mode’ fillings are minimal.. There is a little raised work on halfstitch background in the swags in the bobbinlace. Light, airy appearance, does a lot with conventional motifs. Modifications: Ribbon is probably not original. Damage: Box a little worn. No obvious damage to the fan or sticks from the photos. Point de Gaze mesh looks good. Sold for £180.00, 3 bidders. Auction ends: June 26, 2016, 11:38 AM PDT. 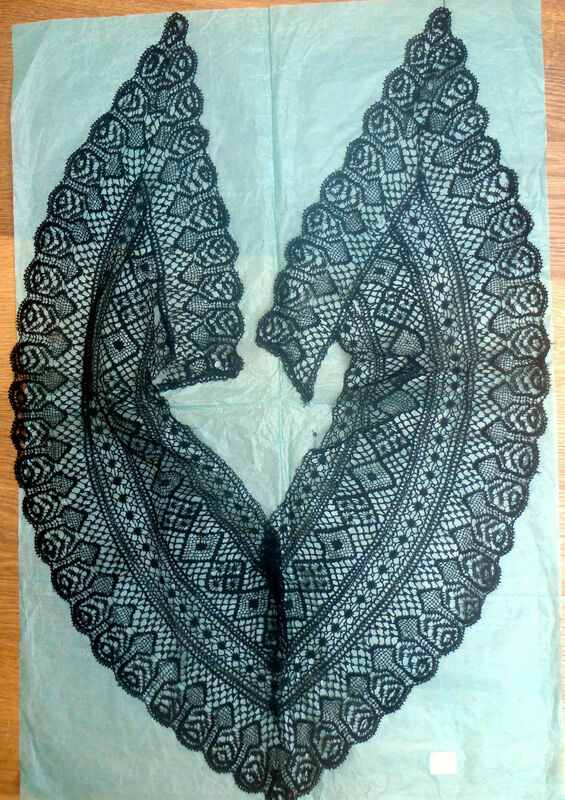 Comments: A Brussels Duchesse lappet scarf. Note the padding in the raised petal rose at the ends. You see this occasionally. It might be just a way to give more relief to the piece. I’ve also heard that the padding might be added by the wearer, having first been soaked in perfume. The design of the piece is fairly simple and a little loosely worked. No raised work in the bobbinlace. Damage: A few pinholes n the PdG mesh. Some loose endings in the bobbinlace work. Soilage: Seller cites occasional slight fraying, a little yellowing. Comments: A Honiton guipure oval mat and small collar. Nicely done, tightly woven. Breaking away from snails/slugs style, but they sill have the ‘flower garden’ or ‘hedge row’ appearance. Picoted brides, good woven tally grid fillings. Damage: A few broken brides in the mat. Collar a little frayed. Soilage: Seller cites a little yellowing on the collar. Auction ends: June 26, 2016, 12:31 PM PDT. Comments: Two short segments of a Brussels Duchesse border, higher end market work. The raised multiple petal roses in the Point de Gaze inserts are quite naturalistic. The design is quite dense and elegantly arranged florals. 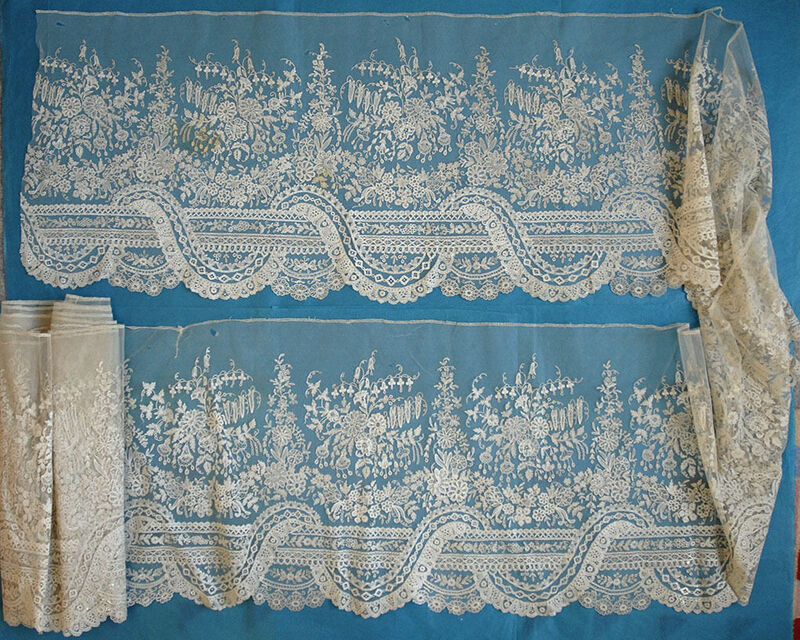 Note the straight border at the top, which makes me think it’s a little later in the 19th c. Irregular unpicoted brides. There’s the usual raised bobbin work on halfstitch ground, but note how the motifs get smaller as the ‘ribbons’ they are laid on curves around and narrow. This is echoed in the different sizes of the circles surrounding the ribbon. I especially like masses of small buds, and the elegant raised work in the bell flowers. Modifications: One end looks like a natural termination, can’t see the other ends. Engrelure added. Sold for $400.00, 2 bidders. Auction ends: June 26, 2016, 3:49 PM PDT. 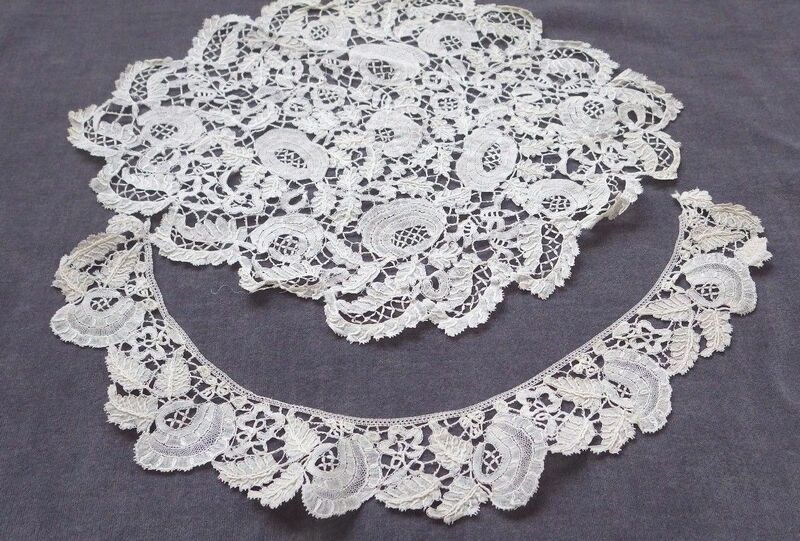 Comments: A deep silk Maltese collar in four part. Outer alternates Maltese crosses and woven leaf oval. Next is some guipure work with woven leaf mats. Next is a wheat ear ring, and the neckline is a line of small woven leaves in an ‘x’ pattern. Well done work in an often seen pattern arrangement. Soilage: Seller cites golden silk color. Finish: Looks like there might be a fold crease center back. Size: 12.5″ across bottom edge, 12.5 from bottom corner to top point. Auction ends: June 27, 2016, 9:00 AM PDT. Comments: A dress front of Carrickmacross applique on machine net. Quite an elegant design, well worked. 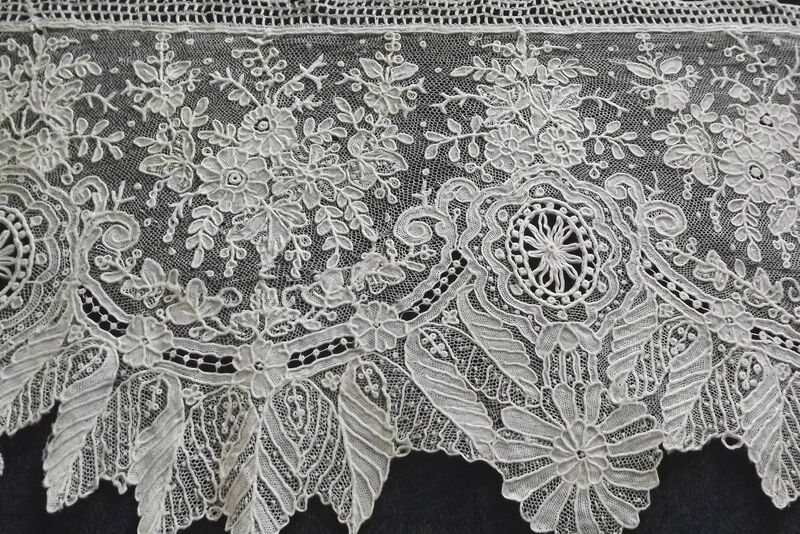 Extensive embroidered net fillings – no bride work, but there are some interesting cutwork elements with brides in flower and leaf centers. Typical looped picots around the outer edge. As the seller notes, some of the ribbons are arranged as shamrocks. Damage: A few small holes in the tulle. 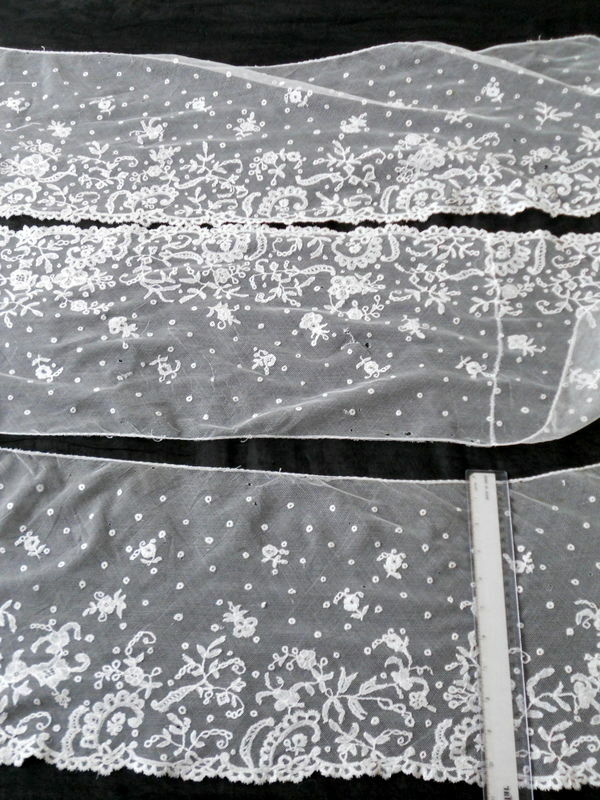 Fraying and damage to several motifs. Soilage: Soiled, some yellowing especially in a strip right of center. Size: 7 yards 28 inches long. No width given. Auction ends: June 27, 2016, 10:15 AM PDT. 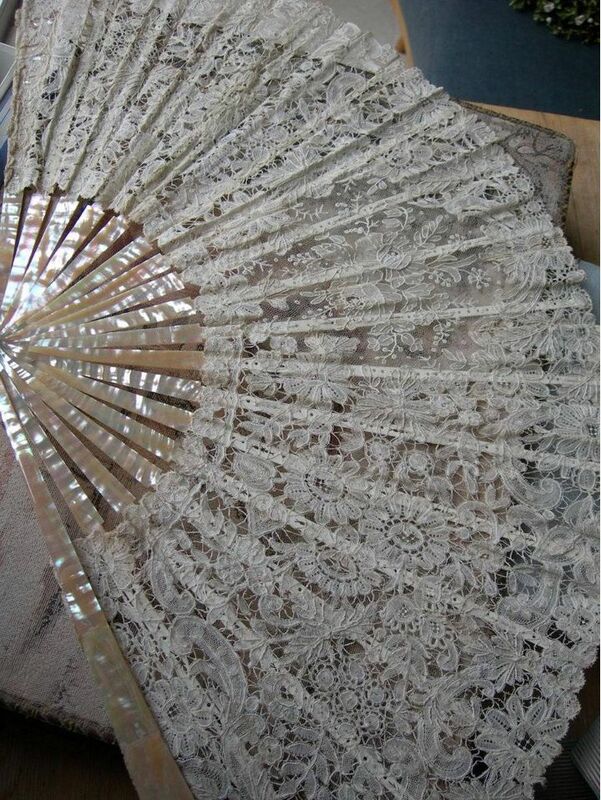 Comments: Brussels bobbinlace crinoline flounce applique on machine net. 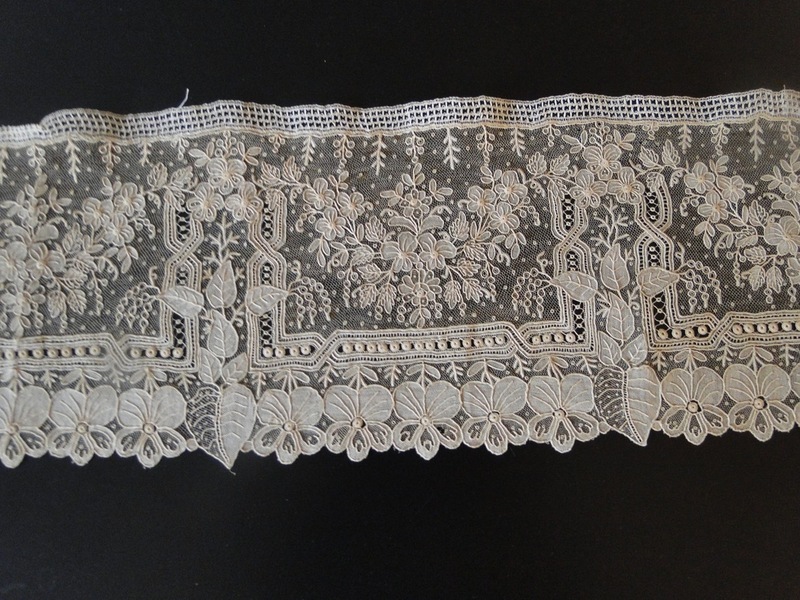 It has a few simple needlelace fillings, but mainly relies on the elaborate 2nd Empire floral pattern. The design is quite complex with elaborate strapwork along the lower edge. No esprits in the upper ground. A higher-end market piece. Provenance: Stored away by one family for man years. Damage: Occasional small hole/pinhole in the tulle, minor. One small repair. Soilage: An area of yellow discoloration near one end. 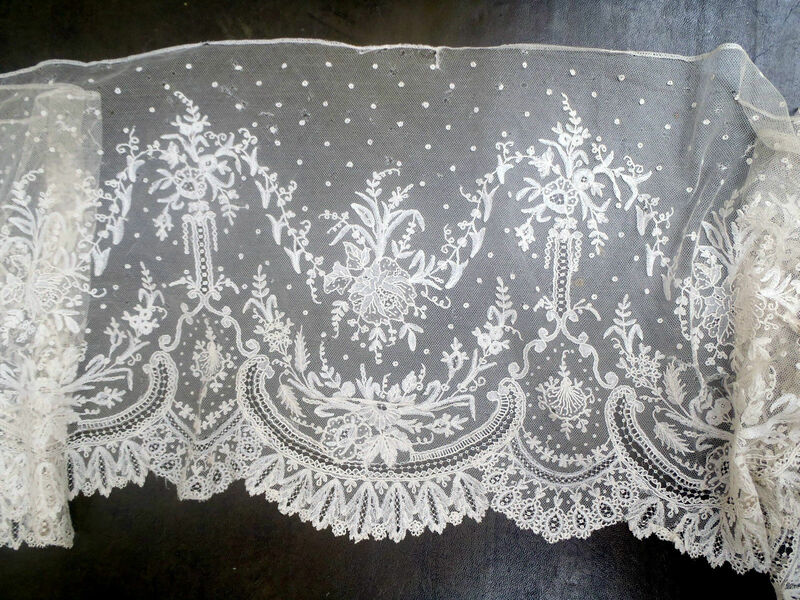 There is some white chalky stuff on the lace in spots, I’ve seen this before but am not sure of the purpose. Might have something to do with whitening. Since this is an unknown, be very careful around it, it might contain lead. Sold for ú1,120.00, 3 bidders. Auction ends: June 27, 2016, 3:00 PM PDT. Comments: This is cute. You occasionally see lace teapot covers, but this is the first reticella one that I’ve seen. Might be Italian, but Cypress was also known to do this kind of triangular work. It needs a padded inner cover to be used. Soilage: Seller cites a few tiny age spots. Sold for $46.51, 4 bidders. Auction ends: June 28, 2016, 9:58 AM PDT. Comments: A Mechlin border, Louis XV style, although it seems like a later piece. The 6 pointed star filling isn’t typical of 18th c. work. Slightly blocky motifs, typical of Mechlin. 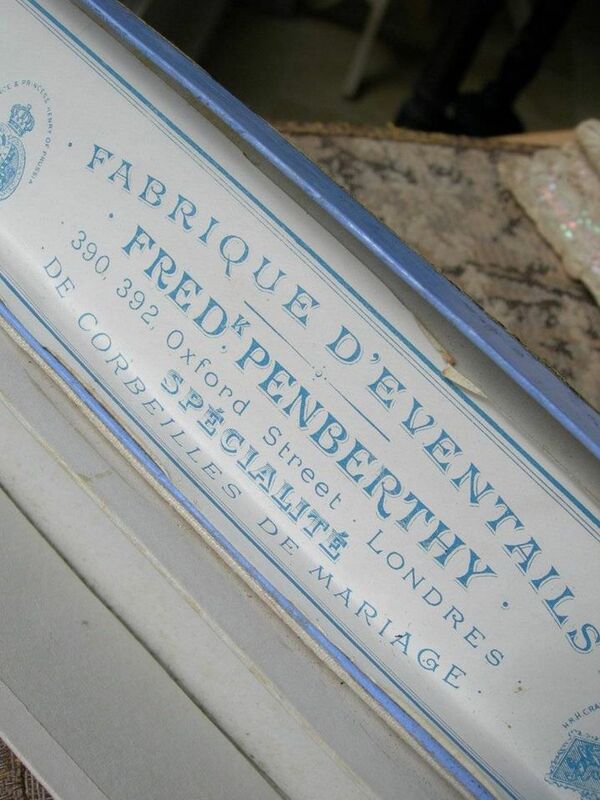 Provenance: From the auction http://tinyurl.com/zbs95qs. Modifications: Top rolled, perhaps cut. Engrelure added. One join. Soilage: Seller says the two joined pieces are slightly different colors, shorter one darker with brown age discoloration. Sold for £18.00, 3 bidders. 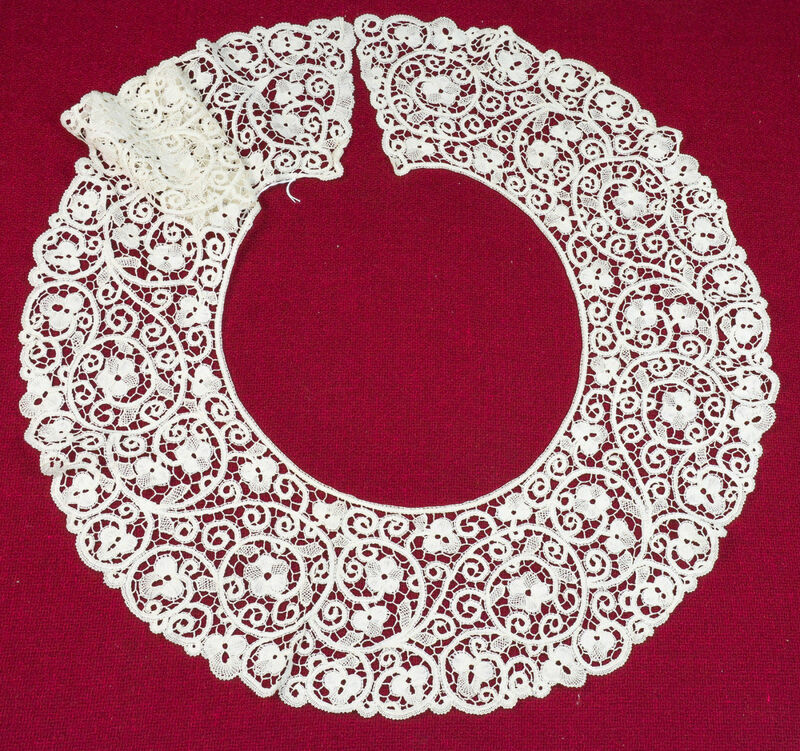 Size: collar – 15.75″ neckline, 3.25″ deep. cuffs – 9″ x 3.25″. Auction ends: June 29, 2016, 10:03 AM PDT. Comments: A matching Rosaline Perlé collar and cuff set, which is unusual to find all together. Can’t tell if the perls are needle or bobbin-made. Dense, well-executed design with lots of rolled rib bobbin raised work. Soilage: Seller cites pale cream/ivory white. Finish: Seems a little shrunken, probably from a past wash.
Auction ends: June 30, 2016, 5:55 AM PDT. Comments: A short length of Point de Gaze. No raised work. Some lines of rings used as fillings, and one large ‘mode’ flower per repeat. Good wide border. Damage: Pinholes in the mesh, one spot where engrelure has been repaired. Other small repairs in the mesh. Soilage: Seller cites light creamy color. Auction ends: June 30, 2016, 10:45 AM PDT. 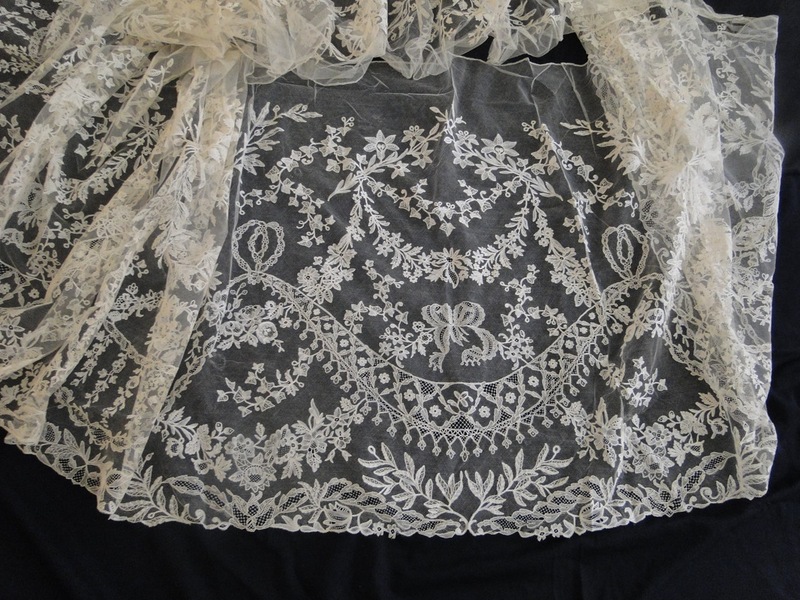 Comments: A crinoline flounce of Brussels bobbin and needlelace applique on machine net. Well thought out design, not too dense. Small esprits in the upper part of he tulle. The needlelace is confined to some roses and some chains of rings and knots used as fillings. Soilage: Seller cites antique ivory color. Sold for £146.00, 17 bidders. Auction ends: June 30, 2016, 11:29 AM PDT. 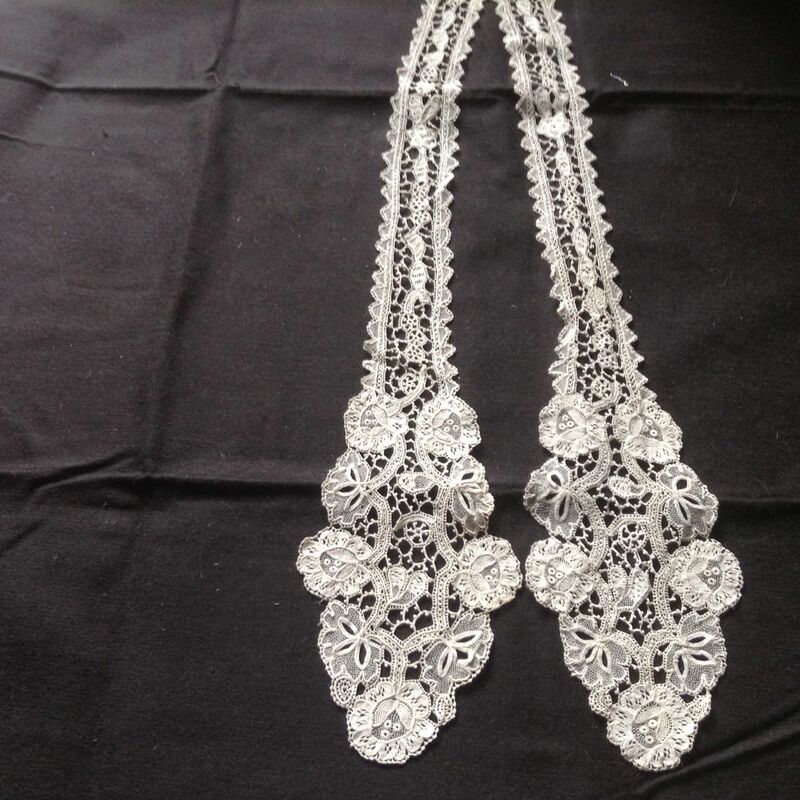 Comments: A black bobbinlace guipure/torchon collar – could be Le Puy black silk. It is an assembled piece from 4 different lengths. I think the outer piece has been gathered around the corners. 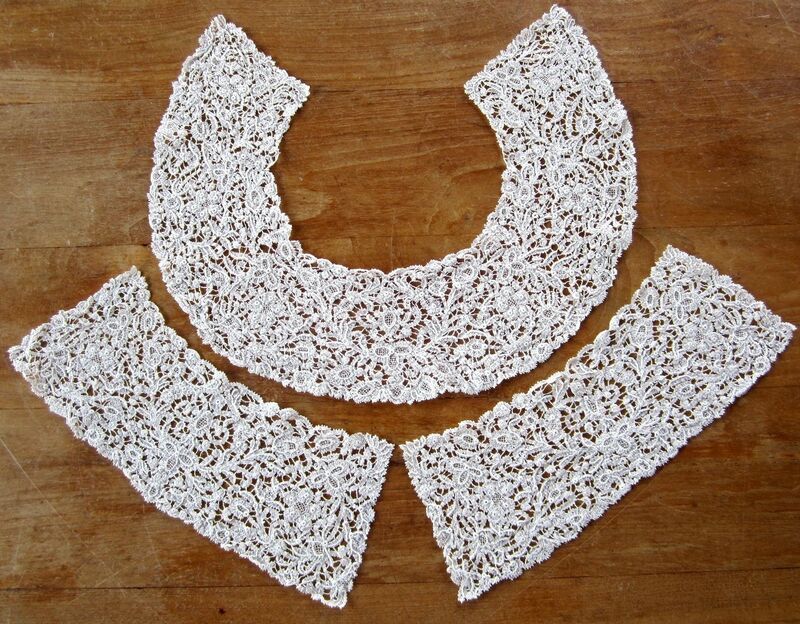 This form resembles some of the shawl collars of Beds lace, and it does get used in Le Puy occasionally. But usually not so ‘pieced’ together from straight lengths. Modifications: None. Stitch to blue paper. Auction ends: June 30, 2016, 12:05 PM PDT. Comments: A Point de Gaze border, no raised work. Elegant ‘pansy’ design with other flowers in square compartments. Note the very heavy rings used as fillings and flower centers. Widely spaced single picots along the lower border. A high-end market piece. Modifications: I think the ends are cut, engrelure added. Damage: A few repairs, occasional small holes and pinholes in the mesh. Soilage: Seller cites ‘original cream color’. Some isolated small brown spots. Auction ends: June 30, 2016, 12:15 PM PDT. Comments: This is the week for Crinoline flounces, although this one is almost a skirt. 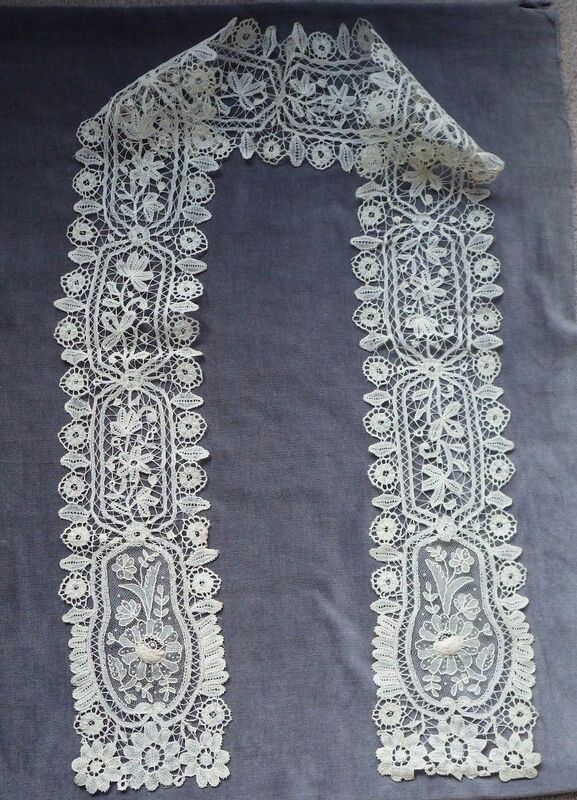 Brussels bobbin and needlelace applique on machine net. Needle-made knots used in grid patterns as fillings. Quite a lot of floral swags, and no esprits in the upper ground. A high-end market piece. Modifications: I’m not sure if this piece is sewn in a circle or just straight. Soilage: Seller cites a cream patina. Size: 36″ neckline, 80″ bottom edge, 5.5″ deep. Auction ends: July 1, 2016, 7:11 PM PDT. Comments: A Cantu bertha. Typical swirling design with five and three headed flowers and hooks. Good incorporation of plaited mesh in the design which gives it an interesting and bold appearance. The thread might be a little heavy. 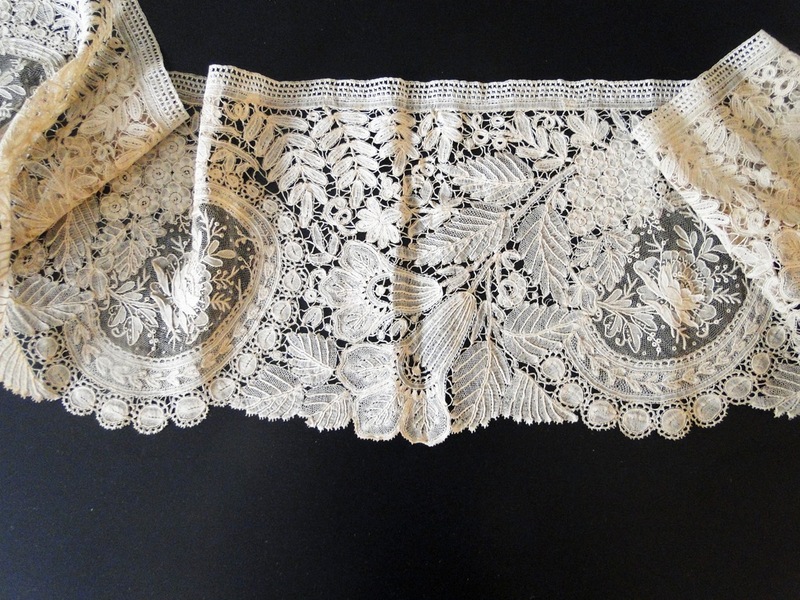 http://tinyurl.com/hmvg53l Vintage Lace Lappet .Brussels Lace? Auction ends: July 2, 2016, 10:22 AM PDT. 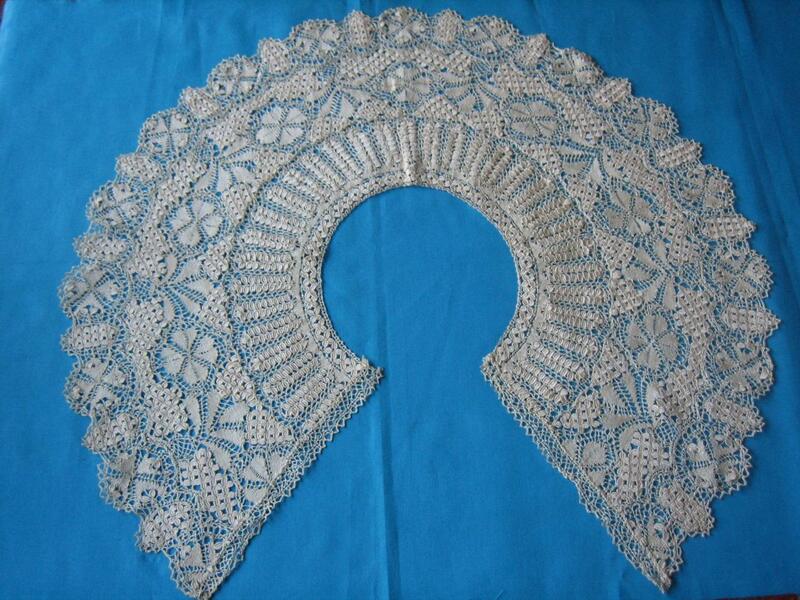 Comments: A lappet scarf of Youghal Needlelace – interesting form for this kind of lace. Only a few motifs, but nicely arranged. Not too much in the way of decorative fillings – it relies more on open grill stitches for shading. Modifications: Can’t see where they are joined to tell if this is intact. Soilage: Seller cites cream color. Sold for 161.99, 8 bidders. Auction ends: July 2, 2016, 5:49 PM PDT. 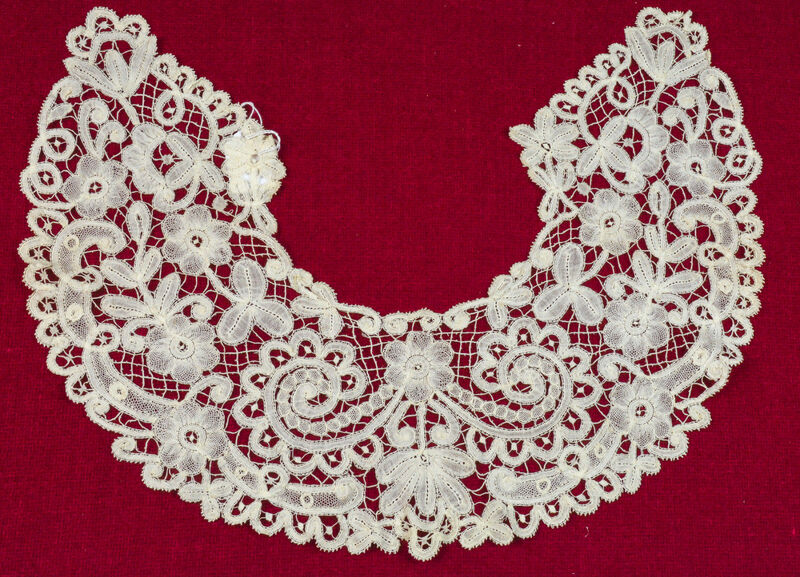 Comments: A collar of Duchesse de Bruges, very much on the Bloemwerk side. Bold design with conventional motifs against a square picoted bride ground. There is a little raised work on halfstitch background in the strapwork. Large woven square tallies used as fillings.